Late last year I blogged about icCube, a new OLAP server that supports MDX. I’ve just heard they’ve released version 1.1 and decided to give it away free (see here) – an interesting development for anyone looking at low-cost or open source OLAP tools, although I suspect it represents competition more for Mondrian than it does for SSAS. This week, the SQLBits committee (which I’m a member of) announced our new event: SQLBits Insight. It’s aimed at CIOs, architects and other senior technical decision makers who are interested in finding out what’s new in SQL Server and how it can help their business. Although it will be taking place on the first day of SQLBits, on April 7th at the Grand Hotel in Brighton, it’s a separate event and very different to anything we’ve done before since it’s aimed at a completely new audience for us. Steve Wozniak, co-founder of Apple and Chief Scientist of Fusion-io. Steve Wozniak will of course be sticking around for the evening to dole out the prizes at the Crappy Code Games, so if you want some free food and booze and a picture of yourself with the great man to make all those Apple fanboy friends of yours weep, then don’t forget to register for it. You don’t need to take part in the games if you’re feeling shy – you can just watch – but of course if you do that you won’t win anything! One of the more popular posts on my blog is one I wrote just over a year ago on binding the results of an MDX query to a table inside Excel. I was thinking about it again recently when I was looking at the list of DMVs (=Dynamic Management Views – views that can be queried using SQL in SSAS and which contain all kinds of useful admin data) available in Analysis Services and noticed several new ones in 2008 R2 that are PowerPivot-related; I assume these are the DMVs that the Sharepoint management dashboard uses to track usage of PowerPivot models after they’ve been uploaded, but it struck me that it would also be cool to have this information available for PowerPivot models while they’re still in Excel. Wouldn’t it be good to query a DMV from Excel? Well, here’s how. Having done this, when you click ok you’ll see the table update with the contents of the query. 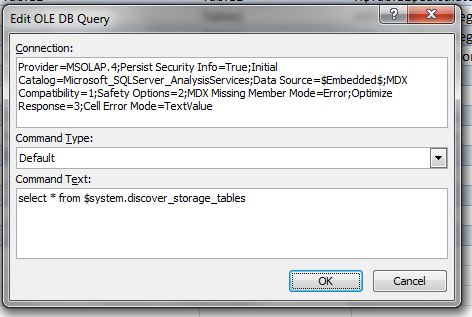 Of course you can enter any MDX query here but I’m going to stick to talking about DMVs. So what useful information can you get from a DMV then? 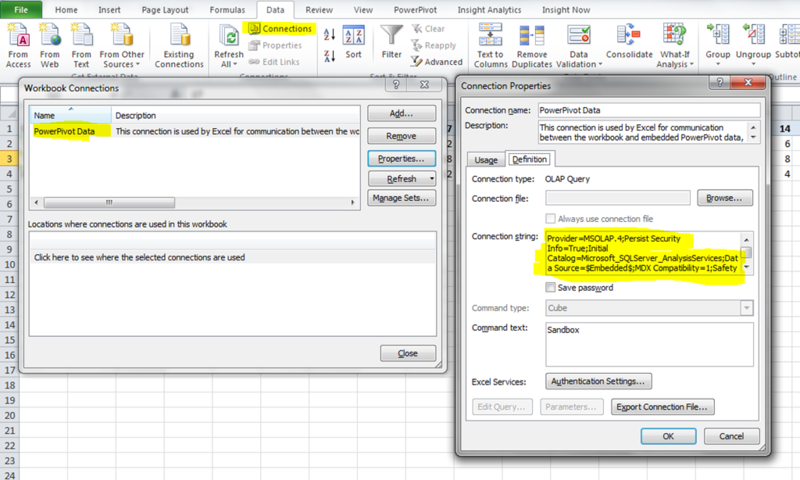 Vincent Rainardi has a great post on SSAS DMVs here which covers all the useful ones and has plenty of syntax examples, but here are some things you might want to do with PowerPivot. …although I’ve noticed some weird behaviour with the dates for some tables, so be careful using it. This gives a full breakdown of memory usage (in the OBJECT_MEMORY_NONSHRINKABLE column) by each object in the PowerPivot model. It’s not all that easy to interpret this information though, because it only gives the memory used directly by each object and you also need to take into account the memory used by all the objects ‘owned’ by a given object too. It’s also worth pointing out that this is not the same view of memory usage that is given by looking at the temp folder created by Vertipaq, which Vidas has blogged about here and here; it shows the size of the database when it has been loaded into memory as opposed to the size of the database when it is persisted to disk, and there can be a big disparity between the two. This gave me the full path of each object in a format that’s directly comparable with the object’s parent as stored in OBJECT_PARENT_PATH. How long will it be before it can access data from BigQuery, and is integrated into Google Docs I wonder? It’s interesting that tight integration with Excel, which in theory should be Microsoft BI’s trump card, is being so widely copied by its competitors. After all this product, which sounds similar to what Teradata released last year and what’s possible with Oracle Exadata – all possible through the efforts of Simba – is what SSAS in ROLAP mode delivers on top of PDW and what BISM in passthrough mode will also deliver on PDW. Looking at it from another angle, however, it’s beneficial for Microsoft because all of these solutions provide more reasons for users to stick with Excel instead of moving to web-based or open source competitors, and they help cement Excel’s position as the BI client tool of choice; I suspect this is the more important consideration for Microsoft. I wonder if other companies will be allowed to implement DAX as a query interface for their products, or be interested in doing so if it is possible? Steve Wozniak comes to SQLBits 8! Bronze: Pure Tech Racing 10 person package at PTR’s F1 racing facility includes FI tees, food and drinks. …plus iPods, Windows Mobile phones, X-box 360s, t-shirts and much more. If you want to take part you’ll need to register, and since places are limited we suggest you do so fast; it’s also worth bearing in mind that you’ll have a better chance of reaching the final if you go to the London or Manchester qualifier. For registration for the games and more details (and to kill some time playing a cool retro game) go to: http://www.crappycodegames.com/. Note that registration for the games is separate from the main SQLBits registration. I got an email earlier this week from Eric Nelson telling me about a new Silverlight parameter prompting application for Reporting Services called “Prompts for Reporting Services” that he’s developed and open-sourced, and since it’s got some features that look useful for anyone building SSRS reports on SSAS I thought I’d share it here. Internal/Global Prompts: An internal prompt is just a regular parameter. A Global prompt is a report that’s parameters are used as a report (you can create the prompt once and reference it from multiple reports). 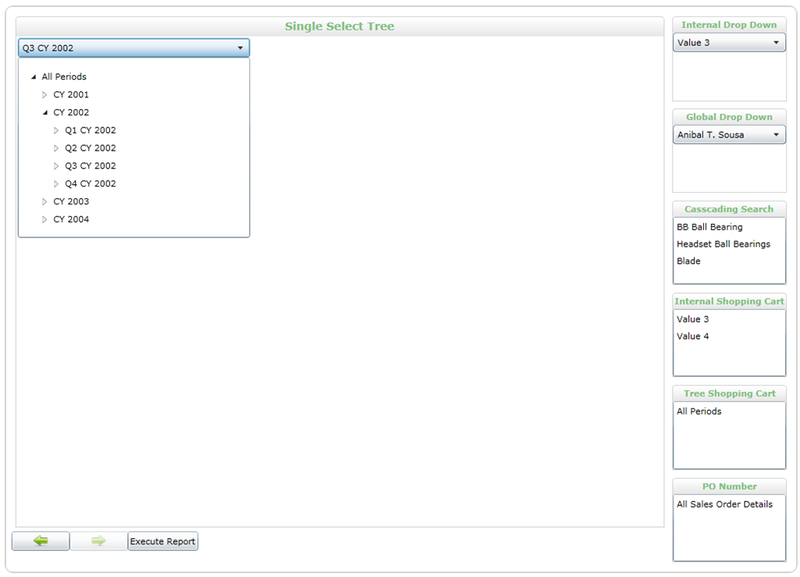 Tree Prompt: This prompt uses cascading parameters for fetching its data which makes it perform really well compared to an indented hierarchy parameter. 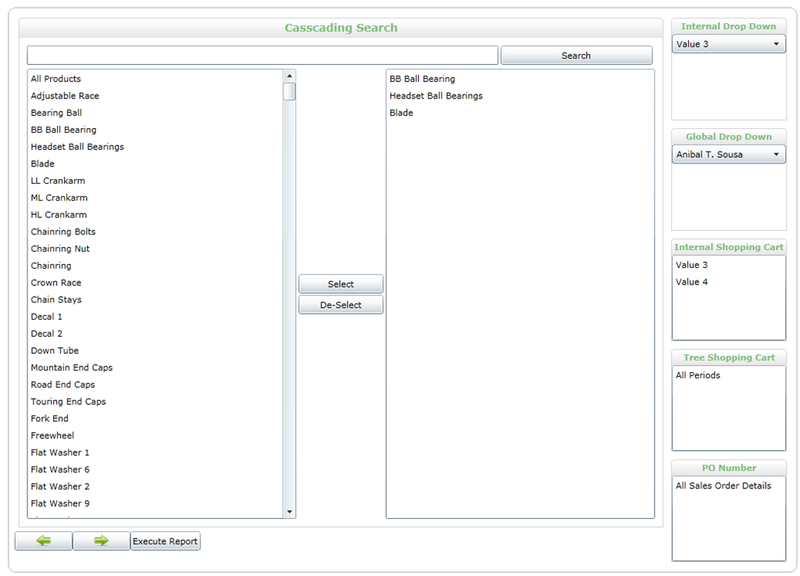 Cascading Search Prompt: This prompt fetches no data to begin with and only queries the cube when a search is executed. I have found this really useful when I parameter is required that has 1,000+ members that tend to lock up the web browser when rendering and are really hard for the user to navigate.